The Duchess Elizabeth necklace features a 14mm crystal AB heart dangling from a stylish twisted beaded pattern with double clovers with a white pearl centre on either side of the necklace. Linkages are made of glass seed beads and white pearls. The Duchess Elizabeth necklace is perfect for that extravagant look for anyone who is looking to impress and is designed to compliment the Princess Esme earrings. 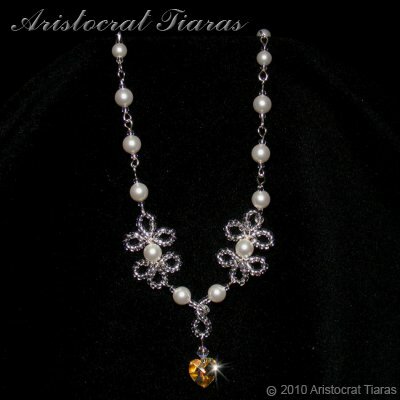 This handmade necklace from Aristocrat Tiaras is part of our bridal jewelry collection for brides designed to compliment our bridal tiaras such as Lady Caroline tiara.